SEOUL, May 28, 2018 (BSS/AFP) - Korean boyband phenomenon BTS have become the first K-Pop group to rise to the top of the US album charts, a vivid illustration of the genre's growing global appeal. Known for boyish good looks, floppy haircuts and meticulously choreographed dance moves, the septet has become one of South Korea's best known and most lucrative musical exports. 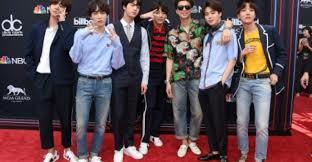 On Sunday, they passed a new milestone -- becoming the first K-Pop group to top the Billboard 200 music charts which ranks albums via sales, downloads and streams. "It's the first No. 1 for the seven-member group, and the first K-pop album to lead the tally," Billboard wrote in its online report detailing the latest chart ranking. While plenty of older music listeners in the West might be asking "who? ", it's hard to underestimate the popularity of BTS and their seven stars Suga, J-Hope, Rap Monster, Jimin, V, Jungkook and Jin. According to one data analysis, they were they most talked about phenomenon on Twitter in 2017, with nearly double the number of mentions on the social media platform than US President Donald Trump and Canadian badboy heartthrob Justin Bieber combined. Throw in their similarly massive appeal across the globe -- they have huge social media followings in Japan, China, Southeast Asia and parts of Latin America -- and you have a truly global supergroup. Their new album "Love Yourself: Tear" toppled "Beerpong and Bentleys" by rising hip-hop star Post Malone, whose facial tattoos are the very antithesis of BTS' wholesome, meticulously manicured image. While BTS sing in Korean, their style successfully fuses the catchy earworms of K-Pop with hip-hop and R'n'B. Last year, their previous release "Love Yourself: Her" became the first K-Pop album to make it into the top 10 US album charts, rising to number seven, and hit the number one spot on iTunes in more than 70 countries.